After the decision in the Canadian Supreme court in the Equustek case, many, including this writer, raised concerns about the possible abuse of the precedent set by the case. The de-indexing of online content, while well-intentioned in the removal of infringing content, could still be used as a sword more than a shield against legitimate infringement, including against free speech. This writer for one awaited the first application of the case, particularly in a jurisdiction that leans more towards free speech, and seems like the wish has been granted by the District Court of the Northern District of California only a few weeks ago. The case of Google LLC v Equustek Solutions Inc. concerns the same subject matter as the Canadian case. In short, Equustek sued Google seeking to force Google to block websites selling infringing goods all over the world, not just in Canada where Google had blocked the websites selling the goods. The Supreme Court of Canada ultimately issued the order, and forced Google to block access to the websites all over the world. Google challenged this ruling in the United States, arguing that the order conflicts with the First Amendment right to free speech, and disregards the Communication Decency Act, which affords immunity to interactive service providers. Justice Davila first looked at the CDA, which affords immunity from claims to "…providers of interactive computer services against liability arising from content created by third parties". This means that should another publisher, using these services, publish infringing content Google couldn't be sued for that infringement. Even so, to qualify for immunity three criteria need to be satisfied: (1) the company is a "provider or user of an interactive computer service"; (2) the information in question was "provided by another information content provider"; and (3) the Canadian order would hold it liable as the "publisher or speaker" of that information. Looking at the first criterion, Justice Davila concluded that Google was a 'provider of interactive computer services'. This means that the company provides "…any information service, system, or access software provider that provides or enables computer access by multiple users to a computer server", which encompasses Google's search facility, among other services. As the content, i.e. the website and the information contained in it (including the infringing goods for sale), was provided by Datalink and not Google, the second criteria was also easily fulfilled. The provision of Google's search facility relies on the company 'crawling' websites on the Internet, which it then indexes and makes available through search results. This allows for users to discover the content, which Google does not post, clearly being provided by 'another information content provider'. Finally, the third criterion looks at whether Google would be held liable for the content provided by another under the order made by the Canadian Supreme Court as the 'publisher or speaker' of that content. According to the order Google has to "…de-index the Datalink websites [from its global search results]… [because it is] the determinative player in allowing the harm to occur". Per the decision in Barnes v Yahoo!, "…removing content is something publishers do, and to impose liability on the basis of such conduct necessarily involves treating the liable party as a publisher of the content it failed to remove". This liability as a third party for the non-removal of content, should Google not do so when ordered, clearly treats Google as the publisher of that content rather than a mere intermediary with no liability. Justice Davila therefore considered that Google was immune from the claim under the CDA. The Court then turned to the question of free speech and irreparable harm. Justice Davila swiftly determined that the Canadian order restricts Google's activity protected by the CDA, and deprives of it of benefits given by US federal law. Similarly an injunction wouldn't serve the public interest, as free speech would be restricted if websites "…were to face tort liability for hosting user-generated content". This has been particularly legislated against through the CDA. 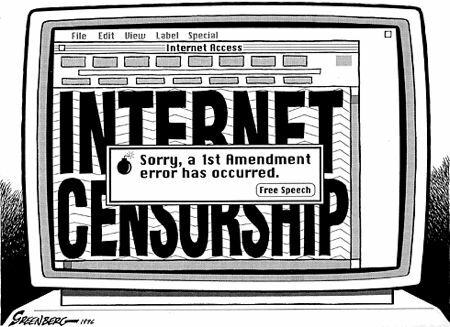 As the Internet and other interactive computer services "…offer a forum for a true diversity of political discourse, unique opportunities for cultural development, and myriad avenues for intellectual activity", the legislature deemed it required protecting for that purpose to flourish. Justice Davila issued the injunction against the Canadian order as it "…undermines the policy goals of [the CDA] and threatens free speech on the global internet". The decision is a very interesting one, and strongly advocates for the protection of the Internet from blanket orders requiring the removal of content globally. This writer is very much a proponent of this approach, as, amongst its faults, the Internet is a bastion of freedom and dissemination of information (including this blog as a very example of that). Infringements should be dealt with appropriately, but blanket de-indexing orders might not be the best way; however, with this in mind, third-party service providers do have to take some responsibility on the removal of content when needed. Labels: barnes, blocking, canada, Equustek, equustek solutions, first amendment, free speech, Google, infringement, interactive computer services, liability, order, provider, supreme court, us, website, wordwide, yahoo!